At this time of year, we’re all more than familiar with April showers. Springtime is traditionally a season well known for its sudden downpours and unpredictable weather – and this is never truer than when it comes to the great British weather. Summer may seem like it is a long way off at this point, but the scorching highs and sizzling temperatures will be here again before you know it. 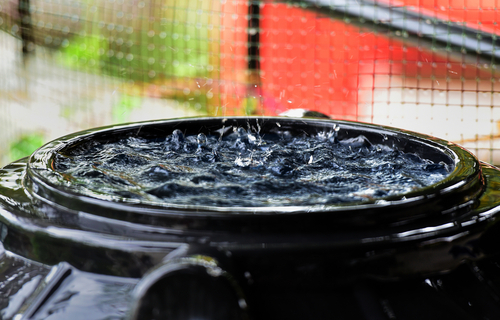 Hosepipe bans and water usage limitations are commonplace, so it’s important to be prepared – and there’s no better way to get prepared than with a rainwater harvesting tank. April 22nd is Earth Day – meaning that now is the perfect time to sit down and have a think about the impact that your water usage has on the environment. Water is of vital importance, but approximately 1.1 billion people around the world lack access to water. Doing our bit to conserve water where possible might seem insignificant when faced with statistics like these, but even the smallest contributions really are beneficial when they are all added up. Choosing to use water storage tanks can really help to save water. A rainwater harvesting tank works by recycling rainwater collected from your roof and directing it into a storage tank where it is filtered – ready for reuse. The water can then be used for a variety of daily household tasks, such as garden irrigation. It is worth bearing in mind that rainwater harvesting tanks are not suitable for collecting or storing drinking water. Rainwater harvesting is the ideal choice for the environmentally conscious, but the benefits go far beyond just being good for the planet. A rainwater harvesting tank can also end up saving you money, preventing the need to spend excessive amounts of money on things like daily hosepipe usage during the warmer months. This can really help to reduce the cost of your water bill, which is particularly useful if you are on a water meter and are conscious about the amount of water your household is using. Rainwater harvesting systems are reliable – with a rainwater harvesting tank, you won’t run the risk of drying out, especially compared to the relatively small storage capacities of traditional garden water butts. They are also relatively easy to maintain, which can cut down on maintenance time and allow you extra time to focus on other household chores. To find out more about our range of rainwater harvesting tanks, please give us a call today on 01889 567700.